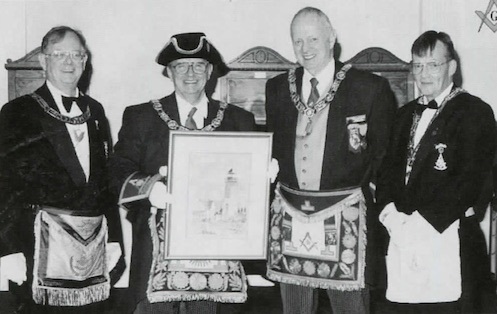 On October 11, 1997, Freemasonry's light on the Lower Cape was brighter as Nauset Light Lodge of Orleans was Constituted by M. W. Arthur E. Johnson, Grand Master, and a distinguished suite. Members and guests enjoyed a buffet luncheon of Stuffed Boneless Breast of Chicken following the Constitution Ceremonies and Installation of Officers of the Lodge. Accompanying the Grand Master were: R. W. Robert L. Steadman, Deputy Grand Master; R. W. Frederick H. Schulenburg, Junior Grand Warden; R. W. Paul W. Rolston, Grand Secretary; R. W. Herbert B. Kinney, D. D. G. M. Provincetown 32nd District; R. W. William F. Carr, D. D. G. M. Hyannis 32nd District; R. W. Louis A. Harmon, Grand Marshal; R. W. Donald B. Scott, Grand Lecturer; Wor. John F. Dietrick, Jr., Senior Grand Deacon; Wor. Archibald A. Martin, Grand Steward; Wor. Thomas E. Pulkkinen, Grand Steward; Wor. Brad Brightman, Grand Steward; Wor. F. Brian Emery, Grand Sword Bearer; Wor. Philip A. Drouin, Grand Standard Bearer; R. W. E. Erik Erickson, Grand Pursuivant and Wor. Kevin T. Jones, Grand Pursuivant. The Grand Master and members of his suite installed the officers for the ensuing year as follows: Wor. Henry P. Burke, Master; Wor. Seth H. Crowell, Senior Warden; Wor. LeRoy E. Atkins, Junior Warden; Wor. Gary A. Getchell, Treasurer; Wor. W. Bradford Morse, Secretary; R. W. William R. Hammatt, Senior Deacon; Bro. Noel Simpson, Junior Deacon; Bro. Brett A. Bauer, Senior Steward; Bro. Carl D. Rydman, Junior Steward; Bro. Robert C. Wood, Chaplain; Wor. Arno Masters, Marshal; Bro. Robert Servidori, Tyler and R.W. Leland D. Cobb, Jr., Organist. Wor. 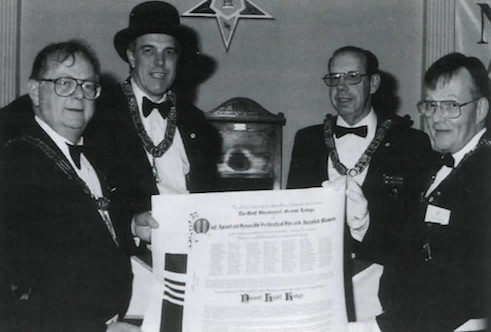 W. Bradford Morse, first Master of Nauset Light Lodge; M. W. Arthur E. Johnson, Grand Master; R. W. Robert L. Steadman, Deputy Grand Master and Wor. Henry P. Burke, Master. (Nathaniel H. Pulling Photo). The highlight of a recent Fraternal Visit to Nauset Light Lodge of Orleans was the presentation to the Lodge of its Charter by R. W. Herbert B. Kinney, D.D.G.M. Provincetown 32nd District. The Charter contains the names of the 101 charter members of the Lodge. Wor. W. Bradford Morse, first Master and present secretary: R. W. Bro. Kinney, D. D. G. M. Provincetown 32nd District; Wor. James C. Killian, D. D. G. M. and Wor. Henry P. Burke, presiding Master of Nauset Light Lodge. Photo by Bro. Robert C. Wood. This page was last modified on 22 September 2016, at 17:51.